LPS22HB click is an easy solution for adding a digital barometer to your design. It carries the LPS22HB MEMS nano pressure sensor. The click is designed to run on a 3.3V power supply. 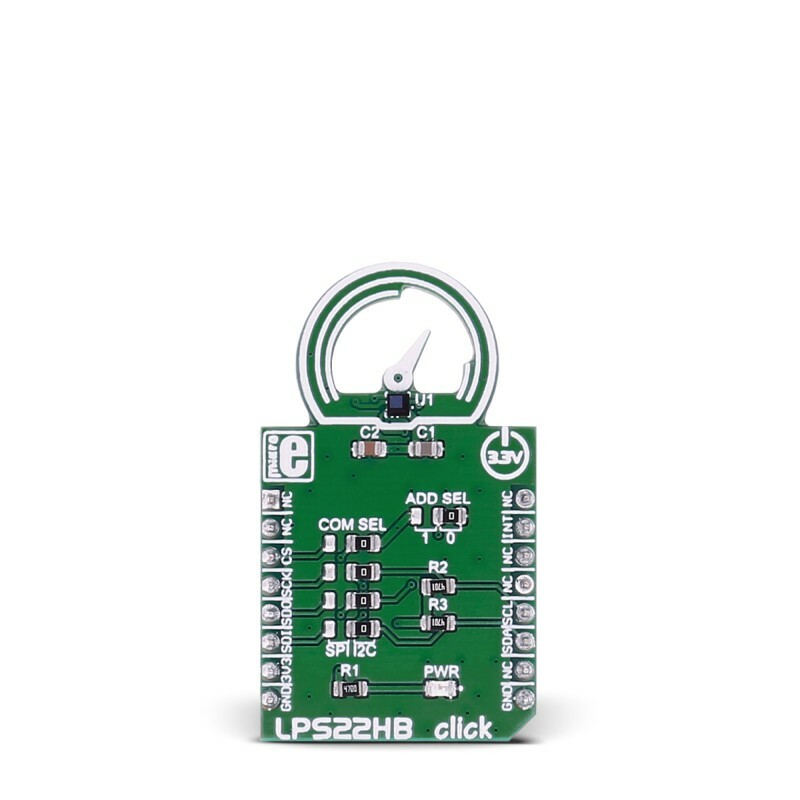 LPS22HB click communicates with the target microcontroller over I2C or SPI interface. LPS22HB click is an easy solution for adding a digital barometer to your design. It carries the LPS22HB MEMS nano pressure sensor. The click is designed to run on a 3.3V power supply. 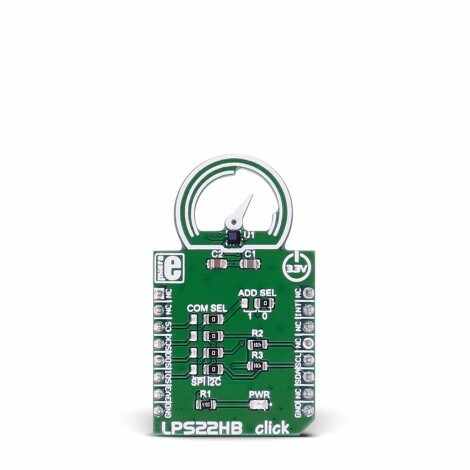 LPS22HB click communicates with the target microcontroller over I2C or SPI interface. 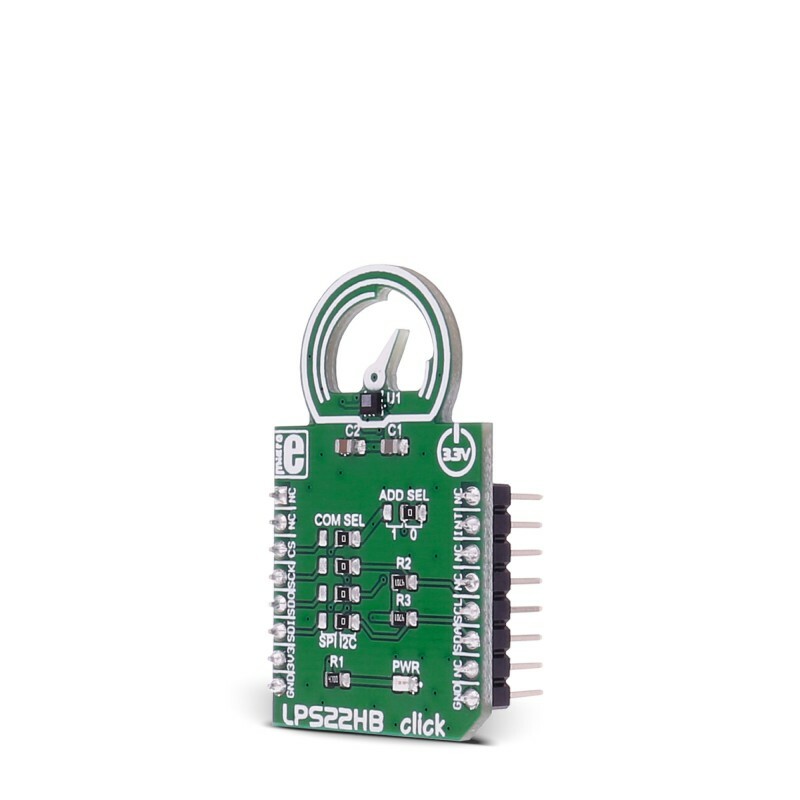 LPS22HB click carries the pressure sensor that measures 260-1260 hPa absolute pressure. Pressure values are then read out from the IC’s registers, through I2C or SPI communication. The LPS22HB is an ultra-compact piezoresistive absolute pressure sensor which functions as a digital output barometer. The sensing element, which detects absolute pressure, consists of a suspended membrane. When pressure is applied, the membrane deflection induces an imbalance in the Wheatstone bridge piezoresistances, whose output signal is converted by the IC interface. 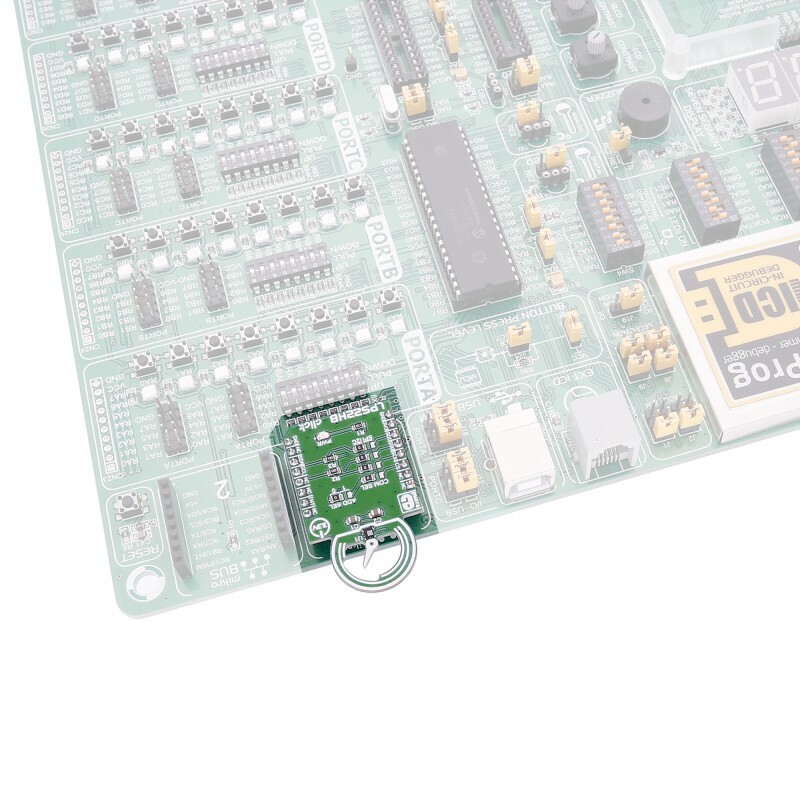 The sensor has a 24-bit pressure data output and a 16-bit temperature data output. Applications Barometers for portable devices, GPS applications, Weather station equipment, etc. 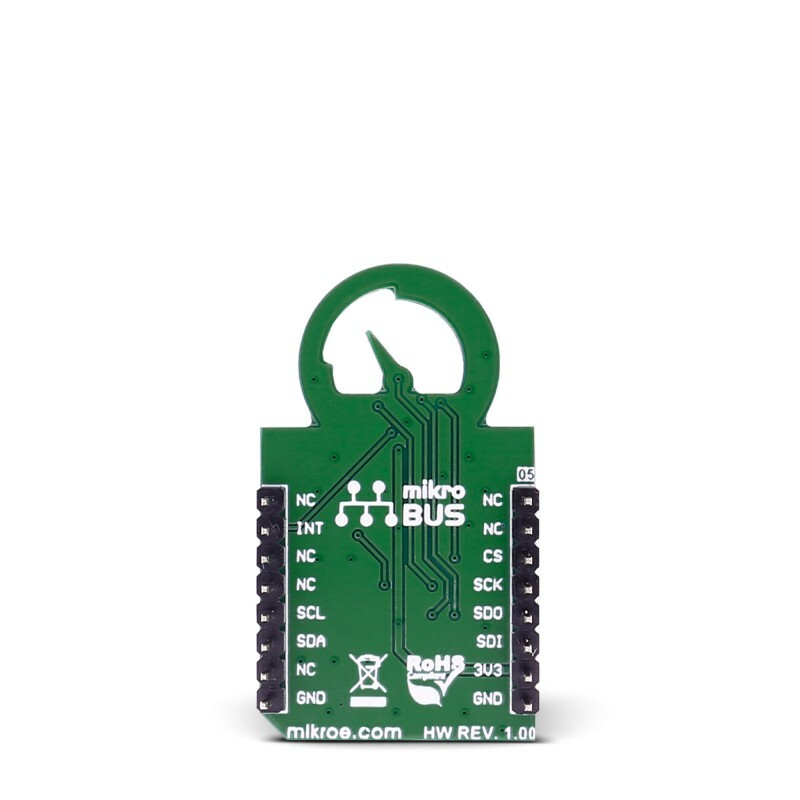 This table shows how the pinout on LPS22HB click corresponds to the pinout on the mikroBUS™ socket (the latter shown in the two middle columns). JP4 ADD SEL Right 0 Less significant bit of the I2C slave address selection 1/0, left position 1, right position 0. PWR PWR LED Power LED, lights green when Board is powered. Code examples for MCP1664 click, written for MikroElektronika hardware and compilers are available on Libstock.